WHO coordinates the major strategic planning, management and administration processes of the Global Polio Eradication Initiative. WHO is responsible for the systematic collection, collation and dissemination of standardized information on strategy implementation and impact, particularly in the areas of surveillance and supplementary immunization activities. WHO also coordinates operational and basic research, provides technical and operational support to ministries of health, and coordinates training and deployment of human resources for supplementary technical assistance. In addition, WHO has a lead role in establishing certification-standard surveillance of acute flaccid paralysis (AFP), resource mobilization, donor coordination, advocacy and communications. WHO serves as secretariat to the certification process and facilitates implementation and monitoring of biocontainment activities. Rotary International is the world’s first and largest humanitarian service organization with a global network of 1.2 million members in more than 170 countries. Through its PolioPlus programme, established in 1985, Rotary was the first to have the vision of a polio-free world. Rotary’s primary responsibilities include fundraising, advocacy, and volunteer recruitment. More than one million Rotary members have volunteered their time and personal resources to polio eradication. Rotary members also provide valuable field support during National Immunization Days through social mobilization and by administering the oral polio vaccine to children. 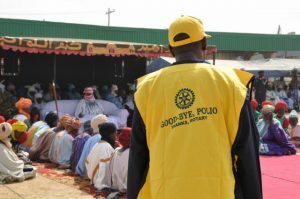 Rotary is the main private sector donor to polio eradication, and will have contributed more than US$ 1.2 billion by 2013. 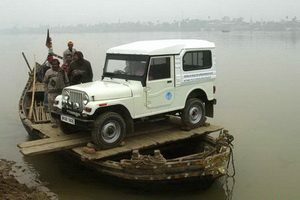 In November 2007, Rotary International entered in a unique partnership with the Bill & Melinda Gates Foundation to inject a further US$ 555 million into the Global Polio Eradication Initiative. 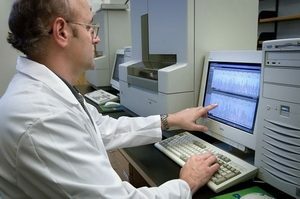 CDC works to protect people from health threats by conducting critical scientific research and supplying health information. CDC provides scientific and technical expertise to the GPEI through the Global Immunization Division (GID), Polio and Picornavirus Laboratory, and Stop Transmission of Polio (STOP) teams. GID staff works jointly with WHO, UNICEF, and other GPEI partners, as well as national Ministries of Health,to plan and monitor polio surveillance and immunization activities in countries, and supports other eradication projects, such as tracking disease transmission trends and vaccine efficacy research. The Polio and Picornavirus Laboratory in CDC’s Division of Viral Diseases is a WHO Global Specialized Laboratory and delivers technical and programmatic assistance to the Global Polio Laboratory Network. CDC’s labs provide critical diagnostic services, perform genomic sequencing of polioviruses to guide eradication efforts, and help overcome specific operational challenges to enable more rapid detection of wild poliovirus and allow for faster outbreak response. STOP staffers help build capacity for acute flaccid paralysis surveillance, the gold-standard for detecting polio, as well as plan, implement, and evaluate immunization campaigns, in collaboration with GPEI partners. UNICEF procures and distributes polio vaccines for routine and supplementary immunizations. With WHO, UNICEF supports countries in the implementation of intensified National Immunization Days (NIDs) and Sub-National Immunization Days (SNIDs), as well as mop-up campaigns in countries. UNICEF helps country programmes develop communication strategies that are vital to local acceptance of the vaccine. 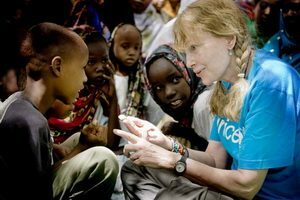 UNICEF also helps country programmes develop action plans and secure logistics to access hard-to-reach places, including in countries affected by conflict. UNICEF contributes to the development of eradication policies, plans of action, training materials and public information, and is an active partner in advocacy and resource mobilization. 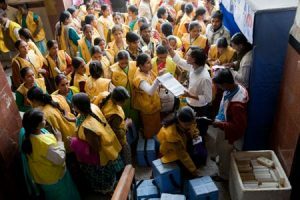 The Bill & Melinda Gates Foundation is a major supporter of the Global Polio Eradication Initiative, contributing technical and financial resources to accelerate targeted vaccination campaigns, community mobilization, and routine immunizations. BMGF works with partners to improve polio surveillance and outbreak response; develop safer, more effective vaccines; and galvanize financial and political support for polio eradication efforts. BMGF has a unique ability to contribute by taking big risks and making non-traditional investments. Examples include investments in vaccine research; funding of geographic information system (GIS) maps to replace hand-drawn maps for campaign planning; and the establishment of emergency operations centres in Nigeria, Pakistan, and Afghanistan. Polio vaccination teams pick up supplies at a railway station in the state of Bihar in northern India.